Come explore Central Florida Habitats, observing plants and animals that were specifically designed to live in them. Our day begins at Blue Spring State Park (Orange City), home to several habitats including hammock, marsh, swamp, flatwoods, and sand pine scrub. 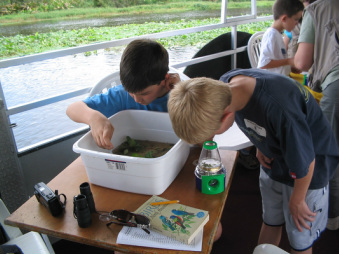 We will cruise the St. Johns River aboard a hands-on, floating science laboratory! We’ll test the river water for temperature, salinity, and turbidity. We’ll dip, collect, and identify specimens of marine plants and animals. And, we’ll enjoy our captain’s narrated introduction to the wildlife and vegetation of this fragile ecosystem. We’ll keep a look out for manatees, alligators, otters, snakes, deer, turtles, birds, and more. 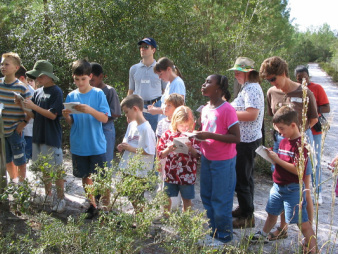 Students will have the opportunity to earn a Jr. Birding Certificate in the “Wings over Florida” program of the Florida Fish and Wildlife Conservation Commission and learn how to continue earning certificates on their own. After our cruise, we’ll hike the boardwalk through the lush hammock along Blue Spring Run as we look for endangered manatees near the head of the springs. Back at the picnic pavilion, we'll see a manatee skull and rib as Mr. Clifton teaches us about manatees from a creationist perspective. Then, we’re off to nearby Lyonia Preserve (Deltona) where we will take a short hike into a scrub habitat looking for one of Florida’s rarest and most threatened birds, the Florida scrub-jay. We’ll learn about other plants and animals created especially for the scrub habitat and contrast them with plants and animals of other habitats we saw in the morning. We'll also visit Lyonia Environmental Center and learn much from its educational displays and exhibits. Maximum number: 38 (limited by pontoon boat capacity). Minimum age: 3 years old due to the Coast Guard / life vest regulations on the boat. Cost: $28 for 3-18 years; $30 for 19 years and over. A fee waiver is available for the first four vehicles in the group that enter Blue Spring State Park. After that, there is a $6 per vehicle (2-8 people) entrance fee for the park. This adventure should be scheduled in November through February for best manatee viewing opportunities. Creation Adventures may be scheduled any day of the week, Monday through Friday. To visit our website calendar and check for available dates or currently scheduled adventures, click here. Our last Central Flori﻿﻿da Habitats field trip was on Friday, November 16, 2018.